There are so many versions of the classics tales out there, that it can be very difficult and confusing to pick the right one for your child. As a purist I always like to reach for the original, but for something like Gulliver’s Travels although the story can work for a much younger age group, the original text is more suited to young adults and older. The poet John Gay wrote to Swift that “it is universally read, from the cabinet council to the nursery.” Of course the word Lilliputian even entered the dictionary, but for those who wish to read it firstly as a simple story with simplified satire, an easier version is required, one without Swift’s wordiness. 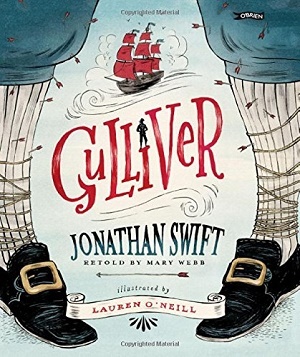 Mary Webb has retold two of Gulliver’s adventures – his time with the Lilliputians in which he is perceived as a giant, and his time in Brobdingnag where the people are giants compared to him. Mary retains much of the original humour and satire, Gulliver’s remarks on the futility of war – when the Lilliputians fight their neighbours over the correct way to crack an egg, and keeps in much of Gulliver’s disgust at the way humans behave – especially when they are magnified to the size of giants. It’s always a pleasure for an author to depict the world seen from a different point of view – in this case either as someone very small, or someone very big. Astute observations can be made about the world when it’s viewed at a distance and from a different perspective. Webb has kept in as much as possible – from Gulliver’s perspective of power to his toileting habits. Lauren O’Neill’s illustrations fit the story very well. A slightly muted grey/blue tinge holds sway over every page, and bold reds illuminate specific features such as flags, sails, capes and arrow tips. There is a good amount of detail, and fabulous drawings of old-fashioned clothes and sail boats, which give clues to the reader as to when the book was written. The very small introduction to Swift’s book on the contents page is particularly excellent. It describes in the simplest and most concise language what Swift was trying to achieve, and what lessons can be extrapolated from the tales. This is a lovely edition that can be enjoyed shared with a parent, or read alone. The red ribbon to mark page position is a well-spent printing cost, and makes the book a good gift option. Buy here from Waterstones.